Boys Bow Tie - simple meaningful crosses and fishes cover this cream cotton bow tie. This Christian bowtie is perfect for first communion, confirmation, baptism, and Sunday church. Four sizes are available: infant (0-3 years), toddler (2-6 years), child (4-8 years), and preteen (8-13 years). The ties are pretied with a full, adjustable neck strap, giving a professional polished appearance. Each tie is made to order, so each will be unique. The infant tie has a velcro closure, allowing it to come undone easily if necessary. As always, adult supervision is required and Because I'm Me holds no liability. The neck strap measures approximately 11-12". Bow tie width is about 3.5". The toddler tie adjusts with a hook, loop, and slide closure system. The neck strap maximum opening is approximately 16". Bow tie width is about 4". The child tie also adjusts with a hook, loop, and slide closure. The neck strap maximum opening is approximately 17". Bow tie width is about 4.5". 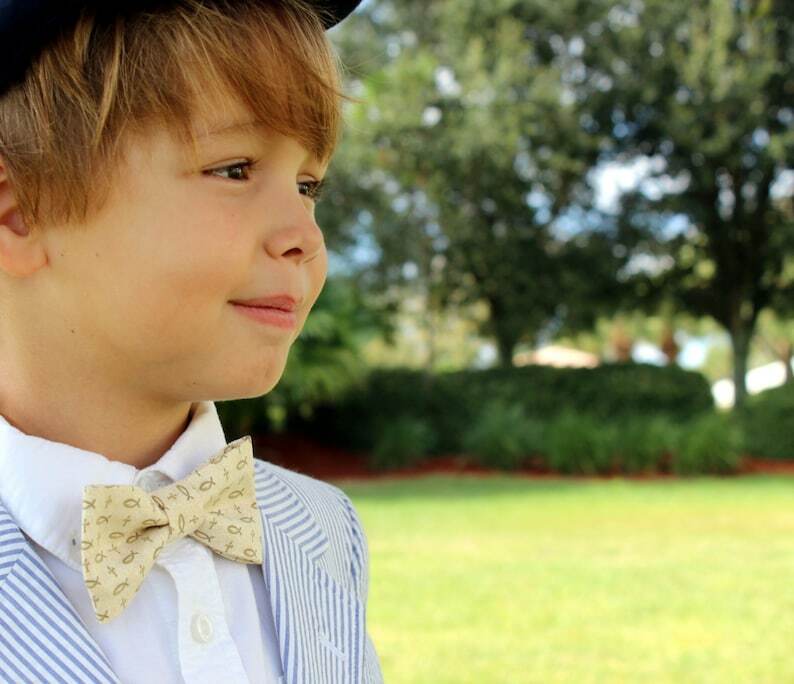 The preteen tie uses the same hardware as the toddler and child ties, with a neck opening of approximately 18". Bow tie width is about 5". Please state upon ordering which size you'd like.